bl.uk > Online Gallery Home	> Online exhibitions	> Asia, Pacific and Africa Collections	> Mill buildings? Gandharia. 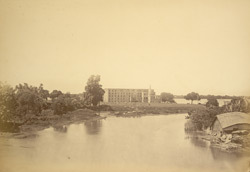 Photograph of Mill buildings in Gandharia.This print was taken in Gandharia, Dhaka District, Bangladesh by an unknown photographer in the 1870s and is from the Temple collection of photographs.